OKLAHOMA CITY - Strong storms swept through parts of the Midwest on Sunday, spawning damaging winds, large hail and at least one tornado as the first official tornado death of 2014 was confirmed. The North Carolina Department of Public Safety confirms that an 11-month-old in Chowan county was injured in Friday's storms in the eastern part of the state and died Sunday, reports CBS affiliate WNCT in Greensville. 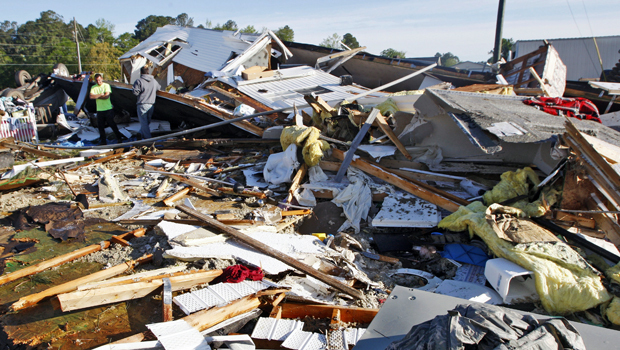 The 11-month-old was the first tornado related death in the nation of 2014, officials said. Governor Pat McCrory sent his prayers to the family and the 11-month-old at an afternoon press conference Sunday, while touring the devastation in Beaufort County. Around 200 homes were damaged by a severe storm which produced a confirmed EF-3 tornado, with winds estimated at 150 mph. It's the latest in the season that an EF-3 tornado or stronger has been recorded since records going back to 1950. Central Arkansas, including the Little Rock area, is at the highest risk of more severe storms later Sunday, The National Weather Service's Storm Prediction Center in Norman, Okla., said. Forecasters also asked people to be alert Sunday for possible tornadoes in a wide swath of the Midwest and south, stretching from Omaha, Neb., south to Texas and east to northern Louisiana and Mississippi. "The greatest risk for a few intense tornadoes will exist across much of Arkansas perhaps into western and central Missouri," a weather service advisory said. Nebraska was the first state to have reported tornado. The National Weather Service said one touched down Sunday afternoon in a rural area in central Nebraska for a short amount of time, but no damage was immediately reported. Tornado watches - which means twisters could develop but aren't an immediate threat - were widespread across the Midwest and southern states Sunday, being issued in Kansas, Missouri, Nebraska, Iowa, Arkansas, Oklahoma, Texas and Louisiana. Even if tornadoes don't form, some areas could see hail and high winds, forecasters said, warning the hail could be as big as baseballs and wind gusts could reach hurricane-force - 75 mph or higher. A strong line of storms moved through west-central Missouri on Sunday afternoon, bringing winds that reached 70 mph hour near Chillicothe, Mo., that toppled some trees. The Missouri Highway Patrol also reported a tractor-trailer was blown onto its side on Interstate 70 about 30 miles east of Kansas City about 1 p.m. No one was injured. The weather service received a report from Plattsburg, Mo., where an anemometer measured 58 mph before it blew away. Golf ball-sized hail was reported at Overland Park, Kan., and Trimble, Mo. A severe thunderstorm watch covered portions of Iowa, Illinois and Missouri through Sunday night. The primary threats were damaging wind gusts and large hail. To the southeast, northern Louisiana and Mississippi were bracing for severe storms along with the possibility of flash flooding. The predictions prompted Barksdale Air Force Base near Bossier City, La., to cancel its air show on Sunday. The National Weather Service said northern Alabama could see rain and flash flooding, while central and northern Georgia could see storms and heavy rain.